His pieces are published by Doberman-Yppan (Canada), Henry Lemoine (France), Suvini Zerboni (Italy), Daminus (Germany), Margaux (Germany), Mel Bay (U.S.A.), D’Oz (Canada), Tuscany (U.S.A.). Several internationally recognized performers have played his works. Among them Shin-Ichi Fukuda, Scott Tennant, Alberto Vingiano, Eduardo Isaac, Pablo Marquez, Antigoni Goni , Trio de Cologne, Gruber-Maklar , Thibault Cauvin, Dimitri Illarionov , Fabio Zanon, Thomas Muller- Pering, Stanley Yates, Patrick Kearney, etc. 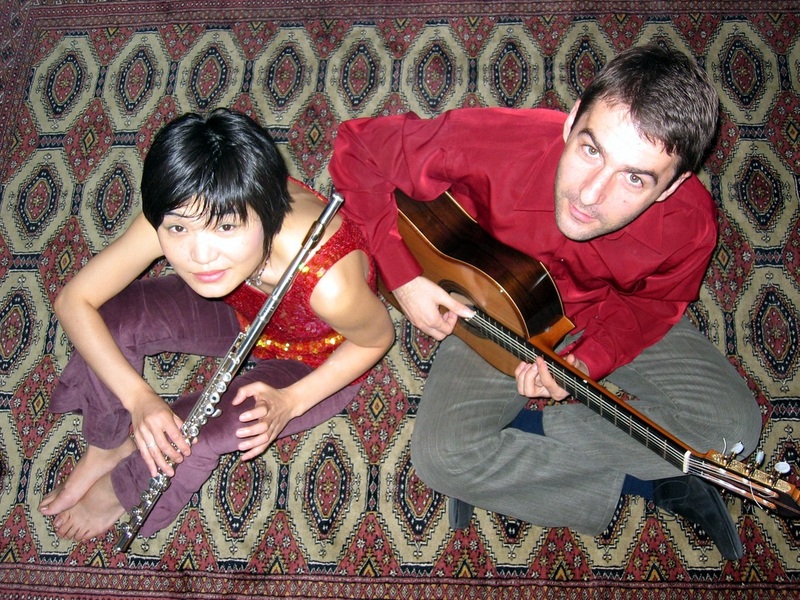 As guitar player he performs solo concerts, with the flutist Mie Ogura and with the Ourkouzounov Ensemble (featuring Alberto Vingiano, guitar, Virginie Constant, cello and Mie Ogura, flute). In 2003 was released the first CD by the Ourkouzounov Ensemble (« Contes des Balkans ») with the Italian label KLE featuring his own music. In 2006 was released his second CD with the flutiste Mie Ogura (music by .Jarrett,C. Debussy,B.Bartok,G.Gershwin and his own pieces),publishe it with the company Gendai Guitar-Japan. He teaches at the Conservatoire “Maurice Ravel”in Paris. In 1989, she finished her studies at the Takamatsu Music Highschool in Japan and obtained the first price in the National students’ Flute Competition in Osaka. In 1994, Mie Ogura moved to France,and in 1999 graduated with DiplÙme SupÈrieur from Conservatoire National SupÈrieur de Musique de Paris under Pierre-Yves Artaud and Sophie Cherrier.. then obtained an improvisation diploma under the tutelage of Alain Savouret. She also studied baroque flute with Pierre SÈchet and jazz improvisation with Glenn Ferris, Pascal Gaubert and Jean-Charles Richard, as well as indian music with Patrick Moutal. In 2001 she obtained a scholarship from the Academia Musicale de Siena(Italy) under AurËle Nicolet(flute) and Alain Meunier(chamber music), also worked with the composer Franco Donatoni who highly appreciates her playing. Since 1995 Mie Ogura has appeared regulary as a soloist and chamber musician with different ensembles and orchestras,among others,Ensemble L’ItinÈraire,Ensemble Entretemps,Orchestre de Chambre de Paris,under the direction of directors such as Peter Eotvos,Mark Foster,Zolt Nagy and others. Mie Ogura has recorded with the ensemble Triton2 (Label MFA,France) , Ensemble Ourkouzounov (Label KLE,Italy) and duo with Atanas Ourkouzounov (Gendai Guitar-Japan 2006), also edited the jazz flute beginners book ´†Flute Jazz Coffeebreak†ª, published in 2005 at Edition Trim(Japan). Flute professor at the Conservatoire “Jacques Ibert” inParis.